Home › Clubs › Real Madrid C.F. Real Madrid CF has probably achieved all a football club could. With a record 32 La Liga titles, 19 Copa del Rey trophies, a sensational 10 European Cups/Champions Leagues and 2 UEFA Cups, Real are second to none in a competition for the greatest football club of all time. While the club enjoys fierce rivalries with Barcelona (El Clásico) and Atlético Madrid (El Derbi Madrileño), Real has been the most supported club in the country for the majority of its history. 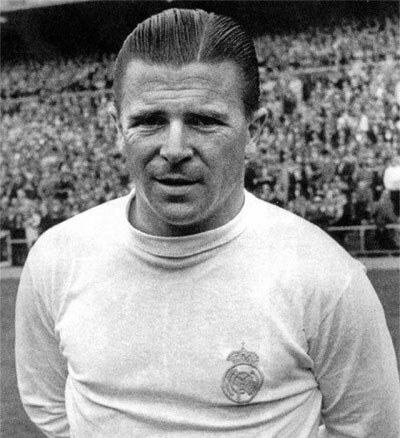 Many of the best players in the world have played in the clubs white shirts, including legends like Alfredo Di Stéfano and Ferenc Puskás. Though the club was founded in 1902, it was originally named Madrid Football Club; it wasn't until 1920 that King Alfonso XIII bestowed them with the title of "real" – or "royal" in English. These early years were reasonably successful for Real, as evidenced by their four consecutive Copa del Rey victories from 1905 to 1908. 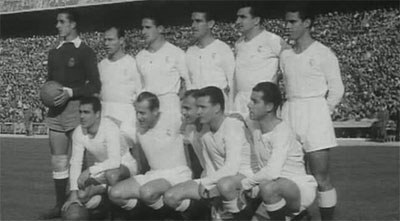 By the outbreak of the WWII, Real could boast with two La Liga titles and seven Copa del Rey trophies. 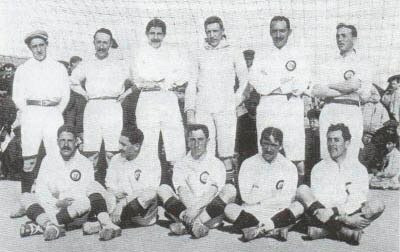 Madrid FC in the season 1907-08. The post-war period saw Santiago Bernabéu Yeste take over as the club's president, after having carried various functions at the club since joining its junior ranks in 1909. Faced with a difficult task of rebuilding the club, Bernabéu went on to construct a brand-new stadium – later renamed to the Santiago Bernabéu stadium – and sign a number of high-profile international players in order to compete at the European stage. With a bonafide dream team centered around the talents of Alfredo Di Stéfano, Ferenc Puskás and Francisco Gento, Real cruised to four La Ligas and one Copa del Rey by the end of the 60s. More impressively, they claimed the first five European Cups ever organized, handily destroying any opposition in their path from 1956 to 1960. This legendary crew is still considered by many to be the greatest football team ever assembled. The two decades that followed were as glorious for the club's growing army of supporters. In addition to cleaning up the domestic competitions by claiming an unprecedented 14 La Ligas and 5 Copa del Reys, the year of 1966 saw Real add another European Cup to their rich collection by defeating Partizan Belgrade 2-1 in the final. The decade was closed out on a sour note, however, with Santiago Bernabéu Yeste passing away in 1978. Ferenc Puskas in the Real shirt. In an article about the history of Real Madrid it would be wrong to not mention General Franco, the dictator of Spain whose leadership lasted over five decades and his favorite team was Real Madrid, which served the team with some unjust favors over the years. Many of such claims are sensitive subject and often without clear evidence. One such controversial and uncertain story is that about the signing of Alfredo Di Stéfano which according to some was on the way to Barcelona when Castro got involved and change the matters of affairs. Another story, that neither is confirmed, tells how Barcelona was threatened by the regime and when lost to Real Madrid with 1-11. The early 80s saw the club drop off the map a bit, but they soon returned with the talented "La Quinta del Buitre" generation consisting of five youth academy graduates and led by the great Emilio Butragueño. After an initial period of struggle, Real finished the decade with five consecutive La Liga titles and two Copa del Rey trophies. It was during this time that Real claimed their only two UEFA Cups, in 1985 and 1986. Comparatively speaking, the 90s were mostly a disappointment for the club's supporters, especially during a slow start to the decade. But the emergence of the talented striker Raúl saw Real improve and grab two La Liga titles and one Copa del Rey trophy before the end of the century. The cherry on top came in 1998, with Real ending a 32-year drought and claiming their seventh European Cup by outlasting Juventus 1-0 in the final. They repeated as champions in 2000 in an all-Spanish affair against Valencia, dispatching them with a comfortable 3-0 victory. Raúl González in one of his 550 matches for Real Madrid. Shortly thereafter, the club was taken over by former politician Florentino Pérez, who immediately set his mind on cobbling together the most famous football team in the world. After signing at least one global superstar every summer – starting with Luis Fígo in 2000 – Pérez successfully assembled a star-studded team that would quickly earn the name of "Los Galácticos." The president of Real Madrid in the 2000s, Florentino Pérez, was responsible for some of the biggest transfers was in international football. His idea of forming the best team possible was to buy big names and not so much thinking of balancing the team. Then Florentino Pérez was the president the club brought together a team of superstars, famously called the Galácticos. The Galácticos era of Real Madrid included players such as Zinedine Zidane, Luís Figo, David Beckham, Christiano Ronaldo and Roberto Carlos. Christiano Ronaldo, one of the Galacticos. In hindsight Pérez ambitions didn't really work out. Although that the project couldn’t be considered as sound it was spectacular and many football fans were probably enjoying the extravaganza. And it wasn't all without results, Real Madrid took a Champions League title in 2003 and also a Spanish league title the same year. After a relatively quiet three years under Ramón Calderón – during which Real still managed to clinch two La Ligas – Pérez returned as president in 2009. As a result, the Galácticos policy was continued by signing Kaká, Christiano Ronaldo, Karim Benzema, Gareth Bale and manager José Mourinho; still, any additional silverware was proving hard to obtain. But after managing to win the 2012 La Liga and the 2011 and 2014 Copa del Reys, Real finally won its tenth Champions League in 2014 with a dramatic extra-time victory over Atlético Madrid. As a result of big transfer fees and wages for star players Real Madrid are notorious for its huge debts. According to the Spanish professor José Maria Gay de Liébana the debt at the end of the 2009-2010 season were €659,9 million. The city of Madrid have helped the team economical, for example in 2001 by buying the training ground of the club for €480 million. The logo of Real Madrid consists of a circle with the stylized initials, “MCF”, for Madrid Club de Fútbol. Visible above the circle, is a crown with a national arms design similar to that in the Spanish Royal crown. The logo has developed through the years from only containing the initials to add a circle around the initials, and finally to the current design (adopted in 1941 with a slight redesign in 2001) with a crown above. The way the letters are stylized in layers are common among Spanish clubs and could for example be found in similar fashions in the logos of Granada CF, Real Betis, Sevilla and Sporting Gijón. 1902 The club is established as Madrid Football Club. 1905 Winning their first Copa del Rey trophy. 1920 The club is renamed to Real Madrid. 1932 First time winners of La Liga. 1947 The club move to the Santiago Bernabéu stadium. 1956 Winning the first edition of the European Cup. 1960 Winning the first edition of the Intercontinental Cup. 1985 First UEFA Cup victory. 1998 First Champions League title. 2000 Florentino Pérez become the new club president. 2012 Real become the first La Liga-club to collect 100 points during a season. 2012-13 Semi-finals Eliminated by Borussia D.
2011-12 Semi-finals Eliminated by Bayern M.
2006-07 Round of 16 Eliminated by Bayern M.
2000-01 Semi-finals Eliminated by Bayern M.